On March 22, 2016 in Toronto, I made the following presentation to the Standing Committee on Finance and Economic Affairs on Bill 173, Jobs for Today and Tomorrow (Budget Measures) 2016. Thank you for the opportunity to appear before the Standing Committee on Finance and Economic Affairs on March 22, 2016 to discuss Bill 173, and Jobs for Today and Tomorrow (Budget Measures) 2016. My name is Shirley Seward, and I am Chair of the Ottawa-Carleton District School Board (OCDSB). In January, I participated in Associate Minister of Finance Mitzie Hunter’s Roundtable on the Provincial Budget in Ottawa, and provided a Submission to this Committee as part of the 2016 Provincial Pre-Budget Consultation. Copies of the Submission have been distributed today. This meeting with you today is very different. The Budget is out, and we expect to receive from the Ministry of Education our Board’s overall Grant for Student Needs (GSN) later this week. I am not here today to argue for a higher grant, but for flexibility from the province in the way we work, in timing, and in the use of the money we receive. Boards across Ontario had been encouraged to plan for a possible one percent decrease in their GSN grant for 2016-2017. In spite of the announcements contained in the provincial budget, we anticipate that there could still be a reduction in funding, amounting to $7.5 - $8.0 million for the OCDSB. This is related to declining enrolment and changes to the funding model associated with the province’s School Board Efficiency and Modernization (SBEM). From our perspective, there are problems applying this goal in the same way for all Boards. Enrolment trends are very different across the province. In the case of OCDSB, we are projecting a very modest decline in 2016-17, approximately 316 students or .4 of one percent of our actual enrolment in 2015-2016 of 71,000 students. Over recent years, there has been relative stability in enrolment. The majority of the decrease in GSN funding is associated with changes in the funding model associated with the School Board Efficiency and Modernization initiative that is removing over 3 years our $8 million top up grant for schools that are not fully utilized. The province has asked Boards to consolidate and close schools that are under-utilized, perhaps where the utilization rate is at less than 65%. In large, complex urban school boards such as OCDSB, this is not an easy or a quick process. Trustees and staff have spent the last year developing and improving our secondary school policy framework and our accommodation review policy. We are trying to balance the province’s immediate fiscal needs with the requirement to look at the needs of our students, schools and the district in the longer term. We are committed to equity for all learners and we live in the capital city where there is a strong community expectation for engagement and a commitment in our political leaders to consult in a meaningful way. As we move forward with this complex process of rationalization of our facilities, we need the provincial government to support our efforts to ensure that all our students have their learning needs met, not only in the short run, but over the next 15-20 years. Such careful planning should not be rushed – the immediate short term fiscal goals may be met, but our fundamental objective should be to provide better learning for all students in the years to come. I was pleased to see in Jobs for Today and Tomorrow the emphasis on support for infrastructure, and I sincerely hope this will extend to our schools and facilities. Despite the capital investments by the Province over the last decade, the current backlog of renewal projects in our school board is in excess of $600 million. It is essential that over the coming months and years, the Province allocate sufficient operating funds to protect its investments in schools. There are a number of mature areas within our Ottawa-Carleton District that are currently experiencing a revival in primary-age enrolment due to neighbourhood turnover and the impact of local development intensification policies. Currently, Education Development Charges (EDCs) fund only those costs associated with acquisition and preparation of land needed for the accommodation of growth-related students. For several years, we have asked the Province to expand the use of EDCs for other purposes, including some aspects of construction and renewal. I understand that the Province may be undertaking a review of EDCs. We would ask the Province to work closely with and involve boards in this review. OCDSB has many years of experience working with the municipality and developers. Even if the Province is able to increase investment in infrastructure, school boards will continue to need the revenue from EDCs. Six years ago, OCDSB had accumulated substantial reserves. With the encouragement of Provincial Cabinet Ministers and area MPPs, we made a decision to use the reserve responsibly over the next few years and invested in particular areas of need, including special education, English as a Second language and our computer and Wi-Fi network. We also made expenditures in order to harmonize our transportation policies with those of our co-terminus board, in order to improve the efficiency of our provincially mandated transportation authority. As we develop our 2016-2017 budget, we no longer have the flexibility that we had with a reserve. We will be debating a budget that could include about one hundred staff cuts. These could be even higher depending on the exact details of the Grant for Student Needs to be announced later this week. In looking for savings, OCDSB staff has suggested it may be necessary to eliminate or shrink a number of longstanding programs. One of the most inequitable of these would be the Summer Learning Program we have provided, with some Ministry support, for over a decade. This program serves the needs of our most vulnerable special needs children, those who are autistic, have serious developmental delays, and severe physical limitations. Some are fed with feeding tubes, others are in wheelchairs. All of these children need continuity and repetition in order to learn. The Summer Learning Program is a 17 day, full day learning program offered during the month of July. It is not a respite or a recreation program. It is a learning program and report cards are issued at the end. The net budgeted cost of the program for 2015-2016 is $342,000 after accounting for Ministry grants and other recoveries of $168,000. We provide July summer school programs for our academic students, both for reach ahead credits and credit recovery, and this is fully funded by the Province. Surely, if we are committed to equity of access to learning for all students this Summer Learning Program for autistic and developmentally delayed children needs to be continued and supported. I noted, with great appreciation, the commitment to autism in the Provincial budget. I am hopeful that this will provide some modest provincial funding so that we can continue the Summer Learning Program in the coming years. In conclusion, we understand the fiscal challenges the government is responding to, and our Board has made substantial progress in reducing expenditures already. The changes to the funding model will mean that the OCDSB will need to further change the way we serve all of our children and families. We look forward to working with the government in the coming months to ensure that the increasingly complex needs of our diverse population are kept in the forefront as we plan for the future. It is hard to believe that the school year has come to an end. Our classrooms and halls are much quieter, and students of all ages are excited that the weather is warm and vacations have started. As we head into summer, parents and students may be thinking of educational opportunities offered by the Board during the month of July. SUMMER ACADEMIC PROGRAMS Students in Grades 7-12 may take reach ahead courses, or may recover a high school credit at summer school. Online courses are also offered. Co-op provides an opportunity to gain valuable work experience. Grade 7 and 8 students may reach ahead and take a secondary school credit. Summer school courses run from July 2-July 24, and online courses run from July 2-July 30. For more information, call Continuing Education at 613-239-2620 or visit the Board’s website. SUMMER LANGUAGE CAMPS for students aged 5-12. Camps are offered for French, Spanish, Japanese, and potentially Serbian languages from July 6-24. These camps have fees starting at $130/week. For more information, call 613-239-2703. SUMMER INTERNATIONAL LANGUAGE PROGRAM. OCDSB offers language courses other than English and French in the morning from July 2-July 24. These are free for Ontario residents, except for a $10 consumables fee. For more information, please call 613-239-2703. It is a privilege to serve you as Chair of the Board and Trustee for River Zone. If you have any suggestions or questions, or need my help, please do not hesitate to contact me at shirley.seward@ocdsb.ca. The labour relations situation is challenging for all of us. Here are some recent developments. Our secondary teachers and occasional teachers (OSSTF) remain in a legal strike position. The OCDSB is one of seven Ontario school districts which OSSTF has targeted for strike action. At the time of writing this arcticle (May 12), strike action is underway by OSSTF at the Durham District School Board, th‎e Rainbow District School Board, and at the Peel District School Board. OSSTF must provide 5 days advance notice of any planned strike action to the OCDSB. To date, we have not received notice and we remain committed to negotiating fair and fully funded collective agreements for our employees. The Elementary Teachers’ Federation of Ontario (ETFO) went on strike in all Ontario’s public elementary schools on May 11, 2015. This strike is not a full withdrawal of services, and all elementary schools in Ontario, including Ottawa-Carleton, are open for classes. During this partial withdrawal of services, teachers will not administer EQAO (standardized testing), and will not write comments in student report cards, among other things. There are some important differences between the elementary and secondary teachers' unions positions. At the elementary level, the union is on strike with respect to 'central bargaining'‎. The school district does not sit at the central bargaining table. At the local level, the school district is continuing to meet with our elementary teachers and occasional teachers, however this is separate from the 'central table' negotiations. If you have questions, please feel free to contact your school principal or e-mail us at chat@ocdsb.ca. As Chair of the Board, the Ontario Ministry of Finance invited me to submit our Board’s input into the next provincial budget. Working with my fellow Trustees and senior staff, we identified the following issues as some of the most important needs of our Board and the 70,000 students we educate and support. ONE: FULL DAY KINDERGARTEN- LARGE CLASS SIZES The Ontario Government has invested heavily in early learning through the introduction of full day kindergarten in our schools. However, in a number of our schools, classes are larger than is optimal. The result of this is that our Board has set up new classes, using our dwindling reserves. This is not sustainable. TWO: CHILDCARE FUNDING – NOT ENOUGH CHILDCARE SUBSIDIES The Ontario Government initiated extended day programs, before and after full day kindergarten, to enrich the early learning of children. Our Board has taken leadership in this area in the province. However, because parents have to pay for this service, the program has benefited those who can afford it but not the poor. More childcare subsidies are needed to ensure all children have access to this early learning opportunity. This is an equity issue. THREE: SPECIAL EDUCATION – FUNDING DOES NOT MATCH NEED Our Board has placed high priority on the needs of students with special needs. On an ongoing basis, we have used our dwindling reserves to provide extra support in this area. The needs are growing year be year and we are feeling the constraints. There is an increased requirement to take funds from elsewhere. This too is an equity issue. No child should fall between the cracks. FOUR: BUILDING NEW SCHOOLS AND ONGOING MAINTENANCE OF OLDER SCHOOLS As certain parts of Ottawa-Carleton grow, there is an increasing need for new schools, as well as an ongoing need for maintenance and upgrading of our older schools to meet safety, accessibility and environmental demands. One change that would help, and would not cost the Ontario Government anything, would be for the Province to redesign Education Development Charges (EDCs) that developers pay when the build new development communities. At the present time, EDCs can be used by the Board only to purchase new land, but not to build new schools on that land. Redesigning EDS for broader use could save the Province money that could be used for other pressing problems discussed above. It is a privilege to serve you as Chair of the Board and Trustee for River Zone. If you have any suggestions or questions, or need my help, please do not hesitate to contact me at shirley.seward@ocdsb.ca or at 613-851-4716. 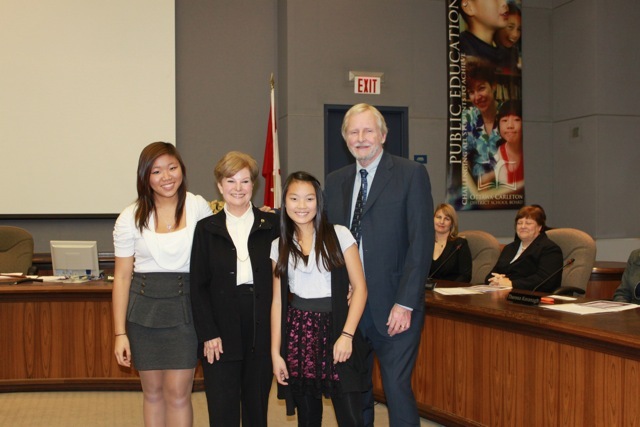 FEBRUARY 2015 - BUDGET TIME AT OCDSB - I NEED YOUR INPUT! This is the time of year when I ask for your input into the development of the annual budget for the next school year (2015-2016). I look forward to discussions and debate with my fellow Trustees and senior staff. I will work on your behalf to improve our efforts to provide access to quality public education for all children, and to close the gaps in achievement and well being based on gender, special needs, English language skills, First Nation/Inuit/Metis status, and poverty. We will face challenges and threats, especially from the Ontario Government that has given notice that it will be looking for savings in education funding. In the Spring, we expect to have greater clarity on the amount of provincial funding we will receive. The strength and diversity of our Board of Trustees and the engagement of all of our stakeholders will help ensure that our focus is always on the students that we educate and nurture, even in difficult times. Can you identify three opportunities for investment that would support student achievement and well-being at OCDSB? Can you identify three opportunities or changes that could generate savings? Our Strategic Plan includes four key priority areas: well-being, engagement, leadership and learning. In your opinion, does one of these priority areas require more attention at this time? At the end of October, I was delighted to be re-elected as the Trustee for River Zone for 2014-2018. And, at the Inaugural Board meeting on December 1, I was elected Chair of the Board by my fellow Trustees. Our new Board of Trustees is an exciting mix of six experienced Trustees who successfully ran for re-election, and six new Trustees who bring new ideas and fresh perspectives to public education. Together we have a unique opportunity to map out a future that focuses on excellent education for all children. 1. What are some examples of key challenges at our schools? 2. What are some examples of things you appreciate about our schools? 3. What are your thoughts about how the school district could better support and engage students, parents, employees and community partners? In January, these same respondents and others will be asked to set priorities amongst the issues identified in December. And, in February, all of the input will be summarized and discussed amongst Trustees at a number of strategic sessions. This grass roots approach to consultation will ensure that the voices of those who are closest to and most affected by our public school system will be heard. If you would like to participate in this exciting process please visit www.ocdsb.ca and register by clicking on Every School Every Voice. As the Chair of the Board, I look forward to leading the Strategic Plan discussions and debate. I will work with my Trustee colleagues to increase our efforts to provide access to quality public education for all children, and to close the gaps in achievement and well being based on gender, special needs, English language skills, First Nation/Inuit/Metis status, and poverty. We will face challenges and threats, especially from the Provincial Government that has given notice that it will be looking for savings in education funding. However the strength and diversity of our Board of Trustees and the engagement of all of our stakeholders will help ensure that our focus is always on the students that we educate and nurture. People sometimes ask me – What does a good Trustee do? The simple answer is - a good Trustee works hard to represent the interests of their constituents, especially parents, students, schools and the community. At the same time a good Trustee provides overall policy direction at the Board, develops and monitors the $800 million annual budget, debates specific new policies and initiatives, and hires and evaluates the Director of Education and the most senior staff. In addition to these duties, there is a broader leadership and planning role for the Chair and Vice-Chair of the Board. As the Vice-Chair, I am involved in long term agenda planning, I participate in a number of ad hoc committees for hiring, Director evaluation, Board evaluation and other activities, and I chair all Committee of the Whole and in-camera meetings. In the absence of the Chair, as happened this past year, I serve as Acting Chair of the Board. In my annual budget consultations with River Zone schools, school councils and parents, people stressed the importance of respect for school administrations, teachers and other school staff with heavy workloads and sometimes inadequate support. This was particularly important for teachers dealing with special needs and behavioural issues in their classrooms. As a Trustee, one way in which I have been able to help was by increasing the Board budget to hire additional emergency/itinerant and in-school educational assistants. The new school year has begun, and our students are settling into their routines and busy schedules. There is a sense of excitement in River Zone public schools, and some dramatic changes as well. Bayview Public School, for the first time, is offering Full Day Kindergarten (FDK) for four and five year olds. This is the fifth and final year of the roll out of FDK in all our public schools in the Ottawa Carleton District. Bayview, like many other elementary schools, also offers Extended Day programs before and after the regular school day. At W.E.Gowling Public School, I worked closely with the Carlington community, my fellow Trustees and Board staff to create a new Early French Immersion program that began this month in senior kindergarten. Over 30 new students registered for this program, strengthening the school and at the same time alleviating overcrowding at the nearest other public school offering early French immersion. Brookfield High School, like other public secondary schools in Ottawa Carleton, is introducing an expanded technology initiative that uses electronic devises such as smart phones and iPads in the learning process in classrooms. Used appropriately by students, and encouraged by educators, technology can improve learning experiences by giving direct classroom access to all the information and learning resources on the Internet. We have also introduced free bus transportation for secondary school students who meet distance eligibility requirements. This appears to be working out quite well so far. Students at Carleton Heights Public School returned this month to their beautifully refurbished and renovated 21st Century school building on Prince of Wales. The school also houses Andrew Fleck child care services and the Parenting and Family Literacy Centre. Carleton Heights continues to provide a middle French immersion program in Grades 4 to 7. At Fielding Drive Public School, there has been a focus on student safety in the context of proposed multi-unit housing construction. In response to resident concerns, I have ensured that the School Board carries forward student safety priorities into the City of Ottawa’s planning process. AUGUST 2014 - Savouring Summer and Looking Ahead! This is a wonderful time of year. Summer is still with us and we are savouring the sunshine and warmth. My children, like yours, are spending as much time as possible outdoors. At the same time, September is drawing closer and parents and students alike are looking ahead to the new school year. Soon our school corridors will be filled with exciting reunions and our classrooms will re-open. What should students be doing as the new school year begins? They should get to know their teachers, because these teachers, educational assistants and other school staff will play a very important role in their lives. Students should also set goals for themselves, such as listening and participating in class, doing their homework and working hard. And students should have fun, reconnecting with old friends and making new ones, joining clubs and sports teams, and becoming involved in school life. We know that students learn and achieve better if they are happy and have a strong sense of well being. As Parents, our role is central to our children’s educational experience. Whether a child is going to school for the first time in junior kindergarten, or about to graduate from grade 12, our involvement in their education is critical. In many schools, there is an information session in the Fall, where parents have an opportunity to meet teachers and administrators, and learn more about the curriculum. I enjoy going to these sessions with my children, and many River Zone parents have told me they attend because it gives them early insight into the new school year. As your Trustee for River Zone, I am looking forward to September too. Board meetings will resume, and Trustees will be working on current and emerging education policy issues. Equally important, I look forward to working with River Zone school councils, parents and the broader community. Together we can ensure that our public education system continues to move from great to excellent. As long as one child falls through the cracks, our work is not done. It is a pleasure to work as your Trustee. If you have any questions or need my help, please do not hesitate to contact me at shirley.seward@ocdsb.ca or at 613-851-4716. JUNE 2014 - Crossing the Finish Line! JUNE is the last month of school. My high school daughter has finished her summatives and is studying hard for exams. Our younger students are completing their projects and reviewing what they have learned this year. It can be a stressful time for students, and I know that parents throughout River Zone join me in saying thank you to the teachers and all other education and administrative staff who inspire and support our children. Good luck, students. We are proud of you! 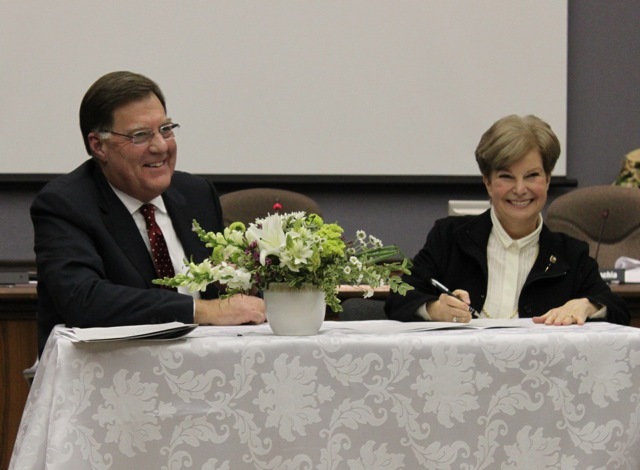 JUNE is also the last month for the Board of Trustees to complete its work before resuming again in September. We are very close to the finish line in finalizing the OCDSB Budget for 2014-2015. As you know, I undertook budget consultations with parents in all of my River Zone school councils, and wrote a Budget Report 2014 that can be viewed by clicking here. The single most important issue that I heard was the need for more educational assistants (EAs) for students with special needs and behavioural challenges. At the June 9 Budget meeting, I was successful in securing $420,000 for an additional 8 new full time EAs. Five will be itinerant emergency EAs, and 3 will be placed in schools. I was also successful in adding an additional $100,000 for playgrounds and outdoor learning spaces that are important for our children’s fitness and well-being. A final vote on the 2014 OCDSB Budget will take place at the June 23 Board meeting at 7:30. This month, we will be putting the final touches on some key policy issues such as childcare for preschoolers and toddlers. I believe very strongly that we must partner with the excellent childcare providers across the District. Many of these providers have been delivering childcare to our children for as long as forty years. The Board needs the childcare community, and we must work in a mutually beneficial partnership. As the school year draws to a close, I look forward to the Graduation and Leaving Ceremonies at our River Zone schools. I am very proud of the work we do together. Our children are our most precious gifts. It is a pleasure to represent you and to contribute to the achievement and well-being of our students. If you have any questions or need my help, please do not hesitate to contact me at shirley.seward@ocdsb.ca or at 613-851-4716. This month we celebrated Education Week at the Board. The theme was Moving from Great to Excellent. This theme is central to Brookfield High School’s Annual Academic Dinner. Brookfield’s Century Club (top one hundred) academic students are honoured at this event. A special thank you to the teachers, school staff, parents and families who inspired these students. Moving from Great to Excellent takes many creative forms in our schools. At Fielding Drive, students enjoyed their first cooking lesson given by the Council Chair during lunch hour. Vice-Principal Josee Beaudry and I enjoyed delicious spinach and fruit smoothies. An OCDSB news release on May 15 spread the news that General Vanier Public School is 50 years old this year and to mark the historic occasion students are creating a time capsule with the help of Artist, Marc Walter. Mr. Walter will be the Artist in Residence at General Vanier Public School from May 16-23. A get together held at the home of Susan Pfister and Ted Radstake across the street from W.E. 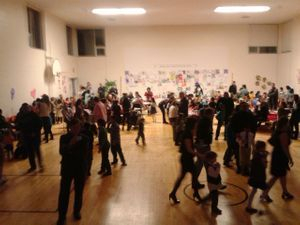 Gowling brought together parents and their children to celebrate the introduction of early French immersion at the school in September 2014. Our youngest future students in their baby seats joined their older siblings and friends for photos in front of the school. Trustee Shirley Seward (white jacket) left of Susan Pfister (blue jacket) and husband Ted Radstake (orange jacket) with "Parents and Children for French Immersion at W.E. Gowling Public School". We did it! Over the past few months, I have held Budget discussions with the School Councils of all of the River Zone schools I represent. These include Clifford Bowey, Bayview, General Vanier, Fielding Drive, Carleton Heights, W.E. Gowling, and Brookfield. I have also received dozens of emails from parents who have ideas or concerns about the Budget for 2014/2015. This outstanding input is helping me to represent the needs and views of River Zone during the Budget debates at the Board. The next Budget meetings at the Board are on May 26 and June 2. These are public meetings and I would welcome your attendance. If you wish to be a delegation at one of meetings please contact Monica Ceschia at monica.ceschia@ocdsb.ca or 613-596-8211, ext. 8381. - Brookfield High School is introducing a new International Certificate in September 2014. Encourage your children to sign up and become global citizens through a rich set of activities that might include study abroad. - Fielding Drive Public School intermediate students have formed a social justice club called We Make Change. This club builds on ME-to-WE, a national movement of youth leading local community and global change. On April 29, 2014 a large group of Fielding Drive students participated in WE DAY, a major educational event held in Ottawa/Gatineau. - Bayview Public School will be offering Full Day Kindergarten in September 2014. If you haven't already registered your child, you can do so any time by calling the school. - Carleton Heights Public School students will be returning to the newly renovated and transformed site on Prince of Wales Drive in September 2014. It will be a 21st Century jewel. - Early French immersion will be introduced at the newly renovated W.E. Gowling Public School in September 2014, beginning with senior kindergarten and growing one grade per year for the next five years. How exciting for the Carlington community and W.E Gowling staff and students. 1. Can you identify 2 or 3 investments that would support student achievement and well-being? Suggestions I have received so far include more emphasis on special education, transportation, school maintenance, technology, and outdoor playgrounds and natural play spaces. 2. Can you identify 2 or 3 changes that could lead to savings? Please contact me with your ideas and concerns at shirley.seward@ocdsb.ca While input is always welcome, I would love to hear from you by May 31, 2014. As I write this article, my 15 year old daughter has just arrived in Gatineau Park for a winter camping trip, as part of her Outdoor Education course offered in many of our public high schools. She will cross country ski to the campsite, pull sleds brimming with food, pots and pans, water, and other wilderness supplies, and then will build a snow structure called a “quinzee”, and spend the night in it. This Outdoor Education course is very popular in our high schools, especially this year with the excitement of the Winter Olympics. Brookfield High School is fully subscribed this year once again. How fortunate our students are to have this extraordinary experience! 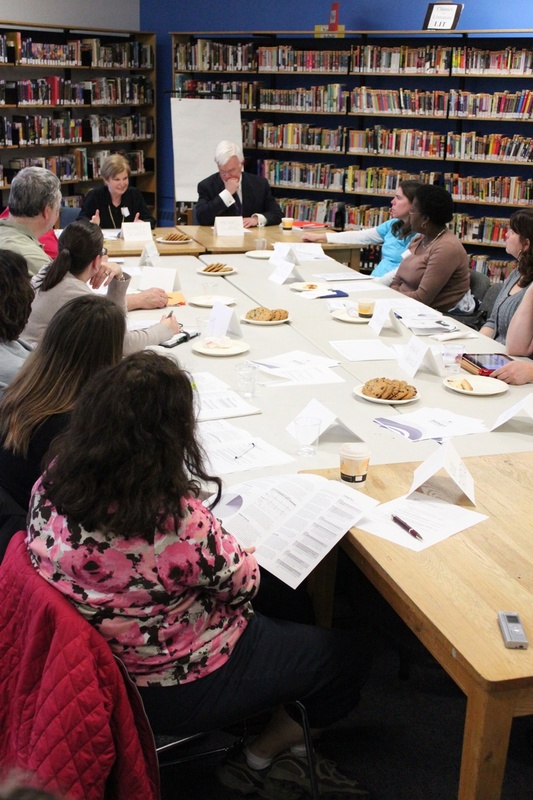 On February 5, Board staff held a consultation meeting on a proposal to introduce Early French Immersion at W.E. Gowling starting with senior kindergarten in September 2014. For more information, and to provide your input, please go to www.ocdsb.ca, Current Accommodation Reviews, EFI at W.E. Gowling. We want to hear from you. What a wonderful celebration we had in this delightful primary school. 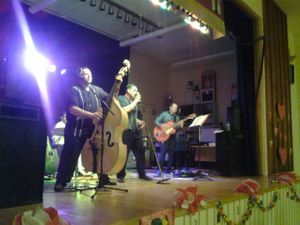 It was fun dancing with the excited children to the music of a “sixties” band. Congratulations to the Parent Council, volunteers and school administration and staff for a night to remember. What a great time we had dancing! Kindergarten Registration is ongoing. For more information go to www.ocdsb.ca or call your designated school. Middle French Immersion Registration – February 18-24, 2014. For more information go to www.ocdsb.ca or call your designated school. To register at Carleton Heights Public School, call 613-224-7922, or 613-596-8730 (July and August). The spirit of the Winter Olympics is present in all our schools. Imaginative principals and teachers are organizing classes and activities inspired by the values so evident in the Olympics: values such as determination, striving for excellence, team work, unselfish caring and the importance of celebrating the richness and diversity of our global society. Our students are proud of the medals Canadians have won. They are equally inspired by the three Canadian sisters who competed with each other while supporting each other, the Canadian coach who gave a ski to the Russian athlete, and the young Canadian skater who gave up his spot to another member of the Canadian team who had a better chance of getting a medal for Canada. Thanks to our educators who brought the spirit of the Olympics into our schools. My first priorities are the students, parents, communities and schools in River Zone. I am always at your service. Please contact me at shirley.seward@ocdsb.ca or call me at 613-851-4716. An energetic group of parents in the Carlington area have formed a group – Parents for Early French Immersion at W.E. Gowling Public School. The group will be presenting a delegation on January 21, 2014 at the Board’s Committee of the Whole meeting. For more information, go to www.gowling-efi.com The group is also on Facebook and Twitter. THAT a staff recommendation report be brought forward to the March 18 meeting of the Committee of the Whole. To see the details of the delegation and my motion, please go the www.ocdsb.ca, go to “Mark Your Calendar”, and click on the January 21, 2014 public meeting. The Ottawa School Transportation Authority (OSTA) has developed proposals on bell time changes for individual schools, to be effective September 2015. While that seems a long time into the future, OSTA is looking for input now. In the coming days, this information will be on the OSTA website at www.ottawaschoolbus.ca and on the Board website at www.ocdsb.ca At this point, affected schools in River Zone include Bayview, W.E. Gowling and Carleton Heights. My first priorities are the students, parents, and schools in River Zone. I am always at your service. Please contact me at shirley.seward@ocdsb.ca or call me at 613-851-4716. November 2013 - It's Getting Cold! Did you know that there has been a major improvement in literacy and math performance at General Vanier Public School? Every year, schools administer province wide tests to see how well students understand and can apply their skills in reading, writing and math. General Vanier Grade 3 students performed better than ever. Congratulations to the Principal, teachers, and all staff at General Vanier. Congratulations to the parents who inspire and nurture their children. And bravo to all the hard-working students! Look at these costumes at the Halloween assembly. Do you like my cool sunglasses? 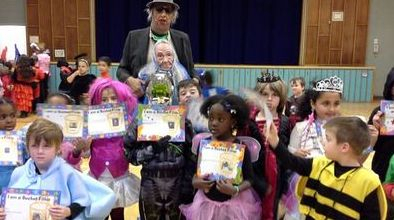 Students at General Vanier receive certificates for their good work at the Halloween Assembly. A costume for me too! I was one of the Trustees who recently voted to provide free busing to secondary students who live at least 3.2 km (walking distance) from their school. This will be effective in September 2014. The cost of an OC Transpo pass can be a burden for parents, especially if they have two or three children. In the coming months our transportation consortium, the Ottawa School Transportation Authority (OSTA), will be holding consultations on walking distances and hazards. Your input is important. Please stay tuned at www.ottawaschoolbus.ca. As Full Day Kindergarten rolls out to all of our schools, including Bayview Public School in September 2014, the Board is exploring the role it will play in the broader child care area. Information sessions and consultations are moving forward. If you are a child care organization, a parent of young children, or a concerned citizen, please have your say. We value and appreciate your input. For more information, go to the OCDSB website at http://www.ocdsb.ca/Pages/Extended-Day-and-Child-Care-Policy.aspx. OCTOBER 2013 - IT'S OCTOBER, ALREADY! It is a beautiful October day. The sun is shining and the leaves are turning red and gold and I have just returned from the Board's School Council Training Day. The turnout was excellent (100 people) and included the new Chair and Vice-Chair of the Bayview Public School Council Maria Clavel and Karyn Cornfield. The agenda included sessions on the roles and responsibilities of school councils, building links between home and school, special education, developing resiliency in students and Council finances and communication. It has been a busy start to the school year. I have been helping parents and students with bus and safety issues, such as helping children at the St. Elias Child Care Centre by changing the location of the Bayview bus stop to a safer location. I have spoken with parents and am working with senior staff to deal with early learning and child care transition issues, the particular challenges faced by our students with special education needs, and mental health concerns, including the ways in which stress and anxiety interfere with student achievement and well being. I have met with the new Principal at W.E. Gowling, where renovation work is almost complete, to discuss her plans to make the school even better. This work reminds me of why I wanted to be a Trustee, and makes me want to continue to serve the needs of students and their families in River Zone. At the Board table this Fall, I am working with other Trustees to provide the best education possible to all our students. This means developing the right policies and making the right choices in allocating resources. One critical policy area is the role the Board should play in the area of Child Care. In accordance with Ontario Government policy, our Board is continuing to introduce Full Day Kindergarten (FDK) in all elementary schools, a process that will be completed by September 2014. Along with FDK, the Board is providing extended day care, either in partnership with existing child care providers or alone, before and after the school day. In a more recent development, the Ontario Government has provided funding to School Boards to retrofit classroom space to accommodate infants, toddlers and preschool children. Trustees have begun a vigorous debate about whether this is an area that the Board should embrace. One critical question, from my perspective, is how this will affect existing childcare organizations who are providing this service in our community. Another critical question is whether there will be equitable access to these child care services, since parents will be expected to pay. Where does that leave the children of less affluent parents? During the Fall, Trustees will also be making decisions on capital priorities in our schools. The need is great throughout our District, but we must develop a list of our top eight priorities for funding from the Province. We are listening to the voices of all our communities. Last year, I fought hard and was successful in securing millions of dollars for major renovations and refurbishment of two schools in River Zone - Carleton Heights and W.E. Gowling. At the request of parents, the students from Carleton Heights have moved to their "satellite campus" at Parkwood Hills Public School during the renovations. At W.E. Gowling, renovations are close to completion, after a summer of hard work. July 2013 - It's Summer Again! What a year it has been! Our last Board meeting took place on July 2, and now it is time to take stock of what we have achieved this year. It is also time to think about the challenges we will face going forward. But first, let us congratulate all of our graduates. What a joy it was for me to participate in graduation and leaving ceremonies in our River Zone schools. I had the pleasure of attending closing ceremonies for Grade 6 students at W.E Gowling and Grade 8 students at Carleton Heights public schools. The students worked hard, and deserve their success. However, as they told me, they could not have done it alone. Parents, grandparents and other family members played a major role in encouraging and guiding their children. And what would students have done without dedicated teachers, EAs, social workers, psychologists, multicultural liaison officers, custodial and office staff and, of course, principals and vice-principals? It is a team effort, and I congratulate everyone who played a role in our students’ lives and education. It was a special year for me too, as a mother. My daughter Sarah graduated from high school as an Ontario scholar and a silver medalist, and is enrolled in Carleton University International Business Degree. I am so proud of her. Wasn’t she a baby, only yesterday? How the years have flown. As the Trustee for River Zone, I am one of 12 elected Trustees responsible for the overall policy framework and $800 million budget of the Ottawa Carleton District School Board. My dual role is to represent the needs and priorities of students, parents and the broader River Zone community, and to make decisions in the best interests of River Zone and the overall Ottawa Carleton District. As a Trustee, I also monitor the policies and activities of the Board on an ongoing basis. I serve on the Board as the Chair of the Audit Committee, and as a member of the Budget Committee and Committee of the Whole. I am a Director on OCENET, the Ottawa Carleton Education Network, as well as a Director on OPSBA, the Ontario Public School Board Association. During the spring of 2013, Trustees began to discuss and debate the annual budget for the 2013-2014 school year. Every year at this time, I seek the input of my River Zone constituents. This year, I posted questions about the budget on this website. Last year, I organized an in-person meeting of representatives of school councils and community organizations. In both years, the input from River Zone was consistent. I heard that the priorities are stronger services in special education, increased emphasis on English as a second language, and refurbishment and renovations for older schools. If you drive by Carleton Heights or W.E. Gowling Public School this summer, you will notice that construction is taking place at both sites, in order to refurbish and renovate these places of learning. During the budget discussions, I was successful in bringing forward a motion to increase the number of special education teachers and educational assistants, as well as the number of English as a Second Language teachers. These new resources have been allocated to some of the neediest schools in River Zone and the overall Ottawa Carleton District. As the letter below shows, parents place very high priority on special education. I meant to send this note before school ended and I just didn't get there with work and travel schedule. I hope this will reach some of you before summer kicks in. If not, you will have it for September when you return. I also hope the email addresses work....if you see something amiss please forward to your colleague. The note is meant for all of you at Fielding Drive who have worked with my child so I truly hope I didn't miss anyone either. Please forward if I did. I wanted to thank all of you for your help and support with my son this year and through Grades 4-7. When we took him out of early French immersion after Grade 2, he had spent the year throwing up before school, calling himself stupid, being totally insecure to speak in public, not able to read in English and not able to write out his thoughts. I was told many times that he didn't fit the desired mould and he should be more this way or that way. He was thought to be a "behaviour problem" or "ADD." We thought we would have to put him in a private school. I worried constantly. Our "bright" boy, who was talking in full sentences at the age of 14 months and had excelled at every pre-school milestone, just didn't seem to fit the public school structure. At one point, we even said, "well...maybe he just won't be 'school smart' and we'll have to accept that." As we discovered, the root of all of these issues was dyslexia, with a splash of Asperger's thrown in for good measure. Fast forward to today. With your collective patience and support, my son is thriving. He loves school, he reads all the time, he speaks with poise and confidence in public. He no longer calls himself "stupid" and was beaming with pride to receive Academic Distinction and be on this year's honour roll. He participated on the track team, took a large role in the drama play and asked a girl to a dance. He socializes with his classmates and has developed some strong friendships. He's been invited to the National Black Belt club and will be pursuing his black belt in karate. He's even letting his wit show, which means he is comfortable with his environment. They say it takes a village to raise a child and it's true. My son spends 24-30 hours a week with you at school. You have helped give him the confidence he needs to begin to find his drumbeat in this world. We concentrate a lot on reading, writing, math and marks as a society. This year, we cried about the lack of extra curriculars and field trips. What we often miss is the human factor that surrounds the school curriculum each and every day. It takes dedicated, patient professionals to teach today's children with all of their various concerns. Your day to day work makes a HUGE difference in the lives of our children and shaping who they will become as contributing members of society. So Thank You. For all you do each and every day to help our kids succeed - whether it is learning a math problem or learning how to better socialize and collaborate with peers. It is appreciated and it makes a difference.You are truly an outstanding group. One of the great pleasures of being a Trustee is being invited to participate in important events in our schools and community. These range from the Academic Dinner at Brookfield High School, the Multicultural Food Fair at Fielding Drive Public School, and school Council meetings across River Zone. 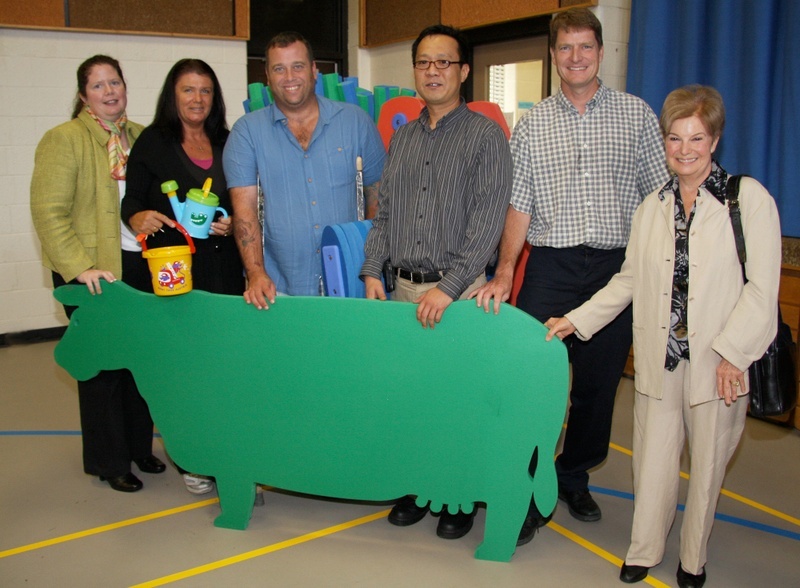 One fascinating event was the opening of a Parenting and Family Literacy Centre at Carleton Heights this spring. From right to left, Principal Andrew Canham, Philip O’Brien (Ministry of Education), OCDSB Director Dr. Jennifer Adams with one of Mrs. Bhinder’s sons, Trustee Shirley Seward, Caroline Cote, Coordinator of the Centre, Mrs. Kiran Bhinder with her other son, Jennifer McKenzie, Chair of the OCDSB Board, and two enthusiastic students, Rachel and Tommy. In early July, I participated in the Canadian Somali Mothers Association (CSMA) 5th Anniversary Meeting. Also present were my colleagues Trustee Bronwyn Funiciello and Chair of the OCDSB Board Jennifer McKenzie. Hawa Mohamed, President of the CSMA provides opening remarks with MC Ikram Jama of OCISO, looking on. I certainly don’t want to wish the summer away, but do want to give you a preview of at least one important activity in the Fall. At the Board, senior staff will continue to work on the Near West Accommodation Review, which is concerned with overcrowding at Devonshire and Elmdale Public Schools. At an early stage of this review, senior staff suggested the option of introducing Early French Immersion at W.E. Gowling Public School, to take accommodation pressure off the overcrowded schools by directing students in the EFI program to W.E. Gowling. The option was discussed, but it appears that solutions may be found within under-capacity schools closer to the Devonshire and Elmdale neighbourhoods. While the W.E. Gowling option is unlikely to be adopted as part of the Near West Review, parents and community organizations in and around the Carlington area are very excited by the idea of early French immersion at W.E. Gowling, and have been advocating for this as part of future accommodation reviews, including the potential Far West Review that should begin during the 2013/2014 school year to deal with overcrowding at Agincourt and other public schools. Please keep posted by checking the Board website at www.ocdsb.ca When the timing for the potential Far West review becomes clear, I will post further information on this website as well. In the meantime, enjoy the glorious summer. If you have any questions or concerns, please don’t hesitate to contact me at Shirley.seward@osdsb.ca, or by calling me at 613-851-4716. I am always at your service. March 2013 - Welcome to Spring! Do we dare to hope? Are the snow banks finally going to disappear? It must be Spring, given the renewal that is taking place in our schools in River Zone. And parents are playing an important role in these developments. Carleton Heights Public School will be undergoing a major renovation and refurbishment, scheduled for this Fall. In a special public consultation held on March 18, an overwhelming majority of parents voted to move the students to the now vacant Parkwood Hills Public School during the renovations that are expected to take 8 months. Parents were thrilled that my motion to remove the students from the construction site was approved unanimously by Trustees. I am also working hard to ensure that the child care and extended day programs at Carleton Heights are treated with sensitivity, with priority placed on the safety and well being of our youngest children. At Fielding Drive Public School, change is in the air as well. At a recent School Council meeting, I met with a wide cross section of parents and the new Principal Marc Slesar. We talked about exciting new extracurricular sports and clubs at the school, supervised by the Principal, Vice-Principal and an eager group of parent volunteers. We discussed the vibrant multicultural community at the school, and talked about ways to increase parental engagement. The Principal presented the school budget, and sought input on ways to meet the needs of all students, in both the English program and the French immersion program. I left the meeting with a feeling of great excitement and optimism, as the parent community exercises its role in making the educational experience for our students an outstanding one. Are there areas in which we should be making greater investments? Are there areas in which we could be saving money for other purposes? What other issues should we consider in developing the Budget? Please send your ideas to me at shirley.seward@ocdsb.ca, or call me at 613-851-4716. I am always at your service. As December comes to an end, and our students are looking forward to the holidays, let’s take a few minutes to think about what has happened in public education over the past few months. What seems to be top of mind, for all of us, is the strike that has affected our elementary and high schools – a strike that was brought on by the Ontario Government’s passing of the controversial Bill 115. This is what the media focuses on, but so much more is happening in our schools. Earlier this year, the results of the EQAO tests across the province were released. These tests measure student achievement in the areas of literacy and mathematics/numeracy. In almost all respects, students in the Ottawa Carleton District School Board are doing better than students in the rest of Ontario, and the results are improving over time. This is a major success for our students and is a reflection of the dedication of school administrators, teachers and all education staff. It is a reflection too of supportive parents and hardworking students. Of course we cannot be complacent. We need to do better, especially in mathematics, and the Board has put measures in place to make this happen. But please be assured that I will continue to work hard for the students, parents, schools and community in River Zone. Please do not hesitate to contact me at Shirley.seward@ocdsb.ca or by calling me at 613-851-4716. I wish you and your loved ones a happy and restful holiday season, and my very best wishes for the New Year. On November 22 at 3:00 am the Ottawa Carleton District School Board (OCDSB) reached an agreement with the Ontario Secondary School Teachers Federation (OSSTF) and the strike ended amongst secondary teachers in our high schools. I had the privilege of being the Trustee observer during these negotiations, and I was impressed with the commitment of both sides to meet the challenge together and come to an agreement that respected the needs of students, teachers, the union and the Board. This agreement was sent to the Ontario Minister of Education for approval, and must be ratified by OSSTF members and the Board of Trustees. I believe this is an important first step in getting back to normal in our schools. Parents across the District have made, and continue to make, extraordinary contributions during this period of labour disruption. Parents have helped by coaching extra-curricular sports, monitoring students during lunch hour, keeping libraries open and a whole range of other critical activities. I am proud to be the Trustee for River zone where parents volunteered their time in such large numbers. The spirit of collaboration for our students has been remarkable. * On October 24, I had the pleasure of participating in the Brookfield Awards Ceremony for last year's graduates. Almost 40% of the graduates received recognition as Ontario Scholars (who achieved 80% and over) and 11 per cent were Silver Medalists (who achieved 90% and over). Bravo Brookfield! * Over the Fall, I attended School Council meetings at General Vanier, Carleton Heights and W.E. Gowling. It was exciting to meet the vibrant new Council executives and expanded memberships. Each school enjoys the contribution of seasoned, experienced members and new parents who bring new perspectives. School Councils play a very important role in strengthening parental engagement, which is so critical for student achievement and well being. * At the Board, Trustees discuss and reach decisions on important strategic, program and policy issues including full day kindergarten, extended day care, transfer policy, the role of technology in education and in our schools, and accommodation issues. * This year, I am the Trustee member on the Board's Secondary Review, a multi-year project that examines many aspects of learning at the high school level. This Review has produced a fascinating report called "OCDSB Exit Outcomes”, that talks about the different pathways students can take during the high school years. These can lead to university, college, apprenticeship, work and community life. * As an elected Board member on the Ontario Public School Boards' Association (OPSBA), I regularly meet with Trustees of other school Boards across the province. We are able to share ideas and innovative practices, and I bring this back to our Board discussions. It is helpful to learn how others are dealing with some of the same challenges we face, and to share our own experience as well. This exchange results in better education for our own students, as well as others across Ontario. * Most important, I am at your service. If you have concerns or ideas to share, please contact me at shirley.seward@ocdsb.ca, or call me at 613-851-4716. I look forward to hearing from you, and continuing to work with you. Together we will strive for excellence. I wanted to bring you up to date on the labour relations situation at the school district. As you know, the collective agreements with all of our bargaining units expired on August 31, 2012. We have been negotiating with our unions locally in hopes of having a new agreement in place by the legislated deadline of December 31, 2012. Six of our nine bargaining units will be in a legal strike position effective Monday November 12th. All six of these units belong to the Ontario Secondary School Teachers Federation (OSSTF). This means that secondary school teachers and occasional teachers will be in a legal strike position next Monday. Elementary teachers are not in a legal strike position and will be expected to perform their regular duties. However, the bargaining units in a legal strike position include support positions at both the elementary and secondary level. This includes educational assistants, early childhood educators, office administrators, office assistants, custodial and maintenance staff and professional staff (psychologists, speech and language pathologists, occupational therapists and social workers). We understand that OSSTF has advised their bargaining units to withhold certain services effective Monday, November 12th. Based on that advisory, we believe that supervision will continue in all classrooms, but we anticipate a withdrawal of supervision of students outside the classroom and a withdrawal of other job duties. This means that we may experience challenges with supervision at bus drop off and pick up, recess, lunch hour, hall duty and in other non-classroom activities in both elementary and secondary schools. We are working with our local bargaining units to get a better understanding of the specific impacts and will communicate more information as it becomes available. We understand that provincially OSSTF has resumed discussions with the Ministry of Education. We remain hopeful that this may lead to a resolution in the very near future. Student safety is our first priority. We are committed to keeping schools operating, provided it is safe for students. We are working with unions, our principals and our administrative staff to ensure that we have appropriate strategies in place. During periods of labour disruption, there is always the possibility of full service withdrawal. Although that is not expected immediately, it would be prudent for parents to start thinking about their child care arrangements in the event that we find ourselves in a situation where schools must close. The Board is committed to keeping you informed. School principals will be sending letters home. However, as situations may change rapidly, the most up to date information will be posted to the district website @ www.ocdsb.ca. We will also provide updates on any major changes to operations through the media. I thought it was important for the community to be aware of this information. Since the situation may differ from school to school, and from day to day, please contact your principal if you have any specific questions. September is an exciting time of year. It is a time of renewal, a time of new beginnings, and a time to savour every single day when the sun is shining and summer is still with us. As my teenage daughters left for school on September 4, I remembered the sense of excitement and nervous anticipation I felt about returning to school. What will my classes and teachers be like? Will I make new friends? Change is in the air this September in River Zone. We welcome two new Principals in our schools - Tammy McCormack at General Vanier and Andrew Canham at Carleton Heights. They both bring a wealth of experience with them and they are excited to be in our schools. We say goodbye and a big thanks to Charlotte Patton who has retired, and Jim Taylor who has moved to Glashan Public School. Carleton Heights is providing full day kindergarten for the first time this year, and joins General Vanier and W.E. Gowling in being able to offer this enriching educational environment for our youngest students. Together with its growing middle French immersion program, Carleton Heights is expanding its offerings to a lively multicultural student body. As I write this article, during the second week of school, other changes are also taking place. The Ontario Government’s new Bill 115 was passed in the Legislature. This Bill effectively cuts teachers’ salaries and benefits, and stops collective bargaining between the Provincial Government and the teachers’ unions. The Bill also prevents teachers from using the usual means for protesting the imposition of this Bill. The Bill calls on School Boards to negotiate agreements with its unions before December 31, 2012. This will be challenging given that Bill 115 has already imposed major conditions that are normally part of the bargaining process. The reaction to this legislation varies from school to school across the District. As I write this article on September 14, there is little or no change in some schools. In others, many teachers have stated they will no longer be volunteering their time to run sports teams and clubs, and these activities have been suspended. On September 14, many teachers demonstrated in front of the Premier’s constituency office in Ottawa. Students have also held demonstrations, some at the Premier’s constituency office. As a mother and a Trustee, there is a silver lining to these developments. I have been impressed by the mutual respect and understanding that is evident amongst teachers, administration and students, and this is very evident in our schools in River Zone. What we are seeing is a democratic debate and expression of views in the context of a difficult and emotional environment. Before becoming a Trustee, I spent 15 years as the CEO of a national public policy organization that provided policy advice to all levels of government. My Board consisted of Deputy Ministers, business and labour leaders and senior members of the education community. Our mission was to foster better understanding and cooperation amongst these diverse groups and to reach consensus on public policy issues. We believed in mutual respect, recognition of legitimate differences and the importance of collective bargaining which is enshrined in Canada’s Bill of Rights in our Constitution. By the time you read this article, the situation in our schools may have evolved further. Given the variation amongst schools, I would encourage parents and guardians to stay in touch with your children’s Principals, and to check the Board’s website at www.ocdsb.ca for further information. It is hard to believe that it is already the middle of June, and school is winding down for students. I love this time of year, when I have the privilege of attending the graduation and closing ceremonies at our schools. These occasions bring home to me the ways in which our public schools support our students, help them grow and learn, and develop in each child a sense of pride in their accomplishments. * On June 12, the Board of Trustees approved a budget of $794 million for 2012-2013, up about 1.7% from the current year. The budget includes increases for special education, infrastructure funding, improved transportation, and increased support for new immigrants. All of these improvements were recommended during the River Zone budget consultations I held in early April. * Trustees have approved capital expenditure for rejuvenation and renewal in two schools in River Zone: Carleton Heights and W.E. Gowling. The school councils from both schools did an excellent job helping convince Trustees that work was badly needed. * By September 2012, three schools in River Zone will have full day kindergarten: General Vanier, W.E. Gowling and Carleton Heights. In September 2014, Bayview will join the list. Centre sits on a small working group at the Board that is helping pave the way to successful implementation of the extended day program as the roll out of full day kindergarten continues. * Over the past year I have been centrally involved in the Board’s Secondary Review, which is exploring a range of issues in high schools, including Brookfield in River Zone. We are tackling important questions such as – How do we make our schools true community hubs, serving students as well as families? Should schools be semestered? Should they be large or small? And, how do we make best use of technology and e-learning? The answers will help us make our schools leading edge learning centres. One of the most important factors in student achievement and well-being is active parental engagement. As your Trustee, I am in awe of the parents, school councils, community organizations and immigrant groups who find the time to be actively involved in the public education system. Over the past year, people have come out to speak about childcare, special education, religious accommodation, transfer policy, mental health, inclusion, capital needs in our schools and a wide range of other issues. It is this engagement that makes my job as your Trustee such a joy. But we must never be complacent. If one child falls between the cracks, or is struggling, or feels excluded, that is not good enough. Every child should be able to grow, to learn, and to reach their potential. Since becoming your Trustee in December 2010, I have worked with hundreds of parents whose children were facing difficulties at school. Together, we were able to make necessary changes to help these students thrive. If you have concerns, or suggestions about how we can make things better, I am only a phone call or email away. 1. Can you identify three opportunities for investment that would support student achievement and well-being at OCDSB? 2. Can you identify three opportunities or changes that could generate savings? 3. Our Strategic Plan includes four key priority areas: well-being, engagement, leadership and learning. In your opinion, does one of these priority areas require more investment at this time? 4. Are there other concerns or suggestions you want to bring to my attention at this time? This document provides background information on our current budget, the four priority areas in our strategic plan, the economic climate and budget pressures, and the process that will lead to the final budget decision by Trustees in June 2012. Most of all, I am grateful for the participation of the parents and community members who care deeply about the investments that we make in education, and who have the experience and expertise that makes such a difference within our Board. The focus group consisted of the Council Chairs and parents of all the schools in River Zone: Bayview, Brookfield, Carleton Heights, Clifford Bowey, Fielding Drive, General Vanier, and W.E Gowling, as well as neighbouring Agincourt Rd. Public School. In addition, the President of Carleton Heights and Area Residents Association and a member of the Debra Dynes Family House added an important community perspective to the discussions. This consultation in River Zone took place at an important phase of the budget process, prior to the development of a staff proposal for the 2012-2013 Budget. As such, it is an early input in the process that will include further community consultation in May 2012. As the Trustee for River Zone, I appreciate the efforts made by participants to prepare in advance, and to come to the April 3 meeting with ideas and suggestions. - There was recognition among the participants that special education plays a critical role for some of the most vulnerable students in our District. Indeed, this meeting provided an opportunity for parents to speak with each other after the meeting to discuss some of the special needs of their own children. Concerns were raised about the movement away from specialized classes. Participants also suggested investments should be made in order to shorten the waiting list for students to be assessed by psychologists and other professionals. ?Our children need structure, consistency, stability, routine. Being out of school for a long period of time leads them to regress instead of progress. They too deserve the right to equity in their quality of life? - Participants argued that a second critical opportunity for investment that would support achievement and well-being at OCDSB is major renovation and rejuvenation in older facilities such as Carleton Heights and W.E. Gowling, There was concern about what appears to be a priority on the part of the Board and the province placed on building new schools rather than protecting our investments in existing schools; and between urban needs and suburban needs. Participants argued for a balance between these different types of investments. Some participants expressed concern about the sale of the Bayview property, with nothing yet in place on the site to meet community needs. Others were worried that the current Bayview property will need attention with the introduction of full day kindergarten, and the implications of that for space. - The amalgamation of Boards was mentioned as a cost saving measure by a few participants, while others were uncomfortable with this notion. There was some discussion of the Premier?s reference to the constitutional rights of the Catholic and Francophone Boards. - Participants were divided on whether collective bargaining should be used to generate savings, and were aware of the Province?s position to date. Some participants suggested that temporarily frozen wages may be regarded as fiscally responsible given the current economic climate -- especially in the context of recent widespread layoffs in the Federal public sector and similar cutbacks across the private sector. Other participants argued that teachers and other education staff could become demoralized by the cuts, and this could impact on educator and student well-being. - Some savings could be generated in transportation costs. A concrete example is the 30 vans operated by Clifford Bowey. A participant argued that the vans are not the most effective or safe way of transporting special needs students. A better option in terms of cost and the environment would be larger school buses, with some equipped to be wheelchair accessible. - Effective use of appropriate technology. In some schools, technology is under-utilized or inappropriate to the needs of the student population. In other schools, technology is in short supply and there are long waits for the use of the technology. Appropriate technology, with appropriate training for educators would ensure that this valuable resource is used effectively. In cases where some educators are not comfortable using technology, effective cooperation between educators at the same school can increase levels of utilization for students. - A number of participants suggested that well-being and learning are the key pillars that, taken together, result in student success within our school system. Well-being is sometimes taken for granted, but should not be. One participant?s child early in life faced formidable, life-threatening challenges. This child, through the devotion of her parents and sensitive teachers who responded to her special needs, has found a second home in her school. Participants noted that while much more needs to be done in this area of well-being, OCDSB has a reputation for being in the vanguard as an inclusive, accepting environment. Learning is critically important, and together with well-being, are the pillars for success. - Participants stressed the importance of parental and community engagement. We should strengthen our efforts to build partnerships with business, community organizations and other groups. Participants liked the idea of community hubs that could be built in schools or other organizations. Special mention was made of the importance of engaging the Moslem community, especially in areas of River zone that have a high representation of Moslem students and parents. There was little time to discuss this fourth question, so I encouraged participants to provide input to me or directly to the Board by email. The following is a list of issues that were either raised at the meeting, or sent to me later. - The Arts form an important part of the education of children, as it contributes to both well-being and achievement. The Arts should receive greater attention. - The needs of recent immigrants are very important and should be better addressed on an ongoing basis. In particular, we should strengthen our ESL investments, especially in those schools that have a high proportion of recent immigrants within the student body. · That an interim parent guide will be made available in time for the transfer application period in February 2012. On January 24, the Board of Trustees gave unanimous support to this motion. Parent Guides have been given to all principals who have been advised to distribute them with transfer application forms. It is also available online at www.ocdsb.ca I have asked the Director of Education to seek input from the Ottawa Carleton Assembly of School Councils (OCASC) on how the Parent Guide can be made even more helpful to parents and students. One of my New Year's resolutions was to work hard for fairer provincial funding for better busing of our students. (EMC December 29). The Board has begun a process of harmonization of busing policies with those of the English Catholic Board. This step will give us a higher efficiency status from the Ontario Government, and should result in more provincial funding that will begin to fill the gap between our transportation costs and revenues. More important, it will give our students more equitable busing. This process will move in phases. During the first phase, which I voted in favour of at the Board of Trustees meeting on February 14, walking distance for students in grades 7 and 8 will be reduced from 3.0 kilometers to 1.6 kilometers. Also, the Board supports changes and harmonization of the criteria for determining hazards (for example, dangerous intersections) with the English Catholic Board. However, before any changes are made, the Board strongly encourages our busing consortium, the Ottawa Student Transportation Agency (OSTA) to conduct public consultations. We need your input! The Drummond Report, which was commissioned by the Ontario Government to provide recommendations on ways to cut the provincial deficit was released on February 15. The recommendations to the Premier on education are far reaching. I will be working hard to protect the investments that this government has made in public education. The importance of protecting these investments cannot be overstated. Publicly and fully funded education is the key to Ontario?s future. As 2011 comes to an end, I wish my friends and constituents in River Zone a Happy New Year and the very best for 2012. Like many of you, this is the time of year to think back to what we have achieved. And, like many of you, I make New Year's resolutions. As your public school Trustee, my year begins in September when the children return to school. For our youngest children, September is their first introduction to school. One of the most dramatic developments in the Ottawa Carleton District School Board is the roll out of full day kindergarten in our schools. Two of our own schools in River zone, General Vanier and W. E. Gowling, were among the first schools in the province to receive full day learning. At W.E. Gowling, this has been accompanied by extended care before and after school. As your Trustee, I am working closely with schools such as Carleton Heights, where full day kindergarten will be introduced in September 2012. The Board will be inviting the Carleton Heights Child Care Centre to enter into an agreement to deliver extended care before and after school. I am also working with Bayview school on their plans for 2014. By September 2012, both of my daughters will be in high school, one in Grade 12 and one in Grade 9. As a mother and your Trustee, I am delighted to be centrally involved in a comprehensive review of secondary schools, including Brookfield. This review will tackle important questions such as ? How do we make our schools true community hubs, serving students as well as families? How should schools be configured? For example, should grades 9-12, or 7-12, be the norm? Should schools be semestered? Should they be large or small? And, how do we make best use of technology and e-learning? The answers will help us make our schools leading edge learning centres. · To keep giving strong support to special needs students, particularly those at Clifford Bowey school in our zone. · To work hard for fairer provincial funding for better busing of our students. (Bus questions have come from parents at Fielding Drive and other schools). · To stress above all that students have a safe, secure and creative school experience free from bullying and violence. My daughters Sarah (15) and Rebecca (12) are home from school for the summer. My husband Steven Langdon has just published his first novel. And I have participated in the final Board meeting for this school year and have attended graduation and leaving ceremonies at five wonderful schools. With great joy and excitement we are getting ready to leave on vacation. But before we depart, it is a perfect time to share with you some of the progress made during the past seven months as your new Trustee for River zone at the Ottawa Carleton District School Board. This year, the Board of Trustees debated and passed a balanced and progressive budget that invests in the future of our schools and students. I worked very hard with like-minded Trustees to reverse the cuts that were planned for September 2011 in special education, English as a second language training (ESL) and support for multicultural liaison officers (MLOs). These programs are critical for the success of our schools in River zone and throughout the Ottawa-Carleton District. The budget includes investments to upgrade the quality and safety of our school buildings themselves, and you will notice work being done on many of our schools during the summer months and beyond. And, the budget includes the hiring of new teachers and Early Childhood Educators to staff the growing number of full day kindergarten classes in our schools. As Chair of the Education Committee, I have heard many formal delegations from parents, school councils and child care providers regarding the provincial roll out of full day kindergarten. I have witnessed the successful implementation of full day kindergarten in W.E. Gowling and General Vanier Public Schools, the two first schools in River zone to receive FDK. At the same time, I have heard the concerns and anxieties of parents, the school council and the excellent childcare centre at Carleton Heights Public School, which is slated to receive full day kindergarten in 2012. Many parents at Carleton Heights are worried about ongoing access to childcare and the role of existing childcare providers. As your Trustee, I believe we should celebrate outstanding achievement by our students. 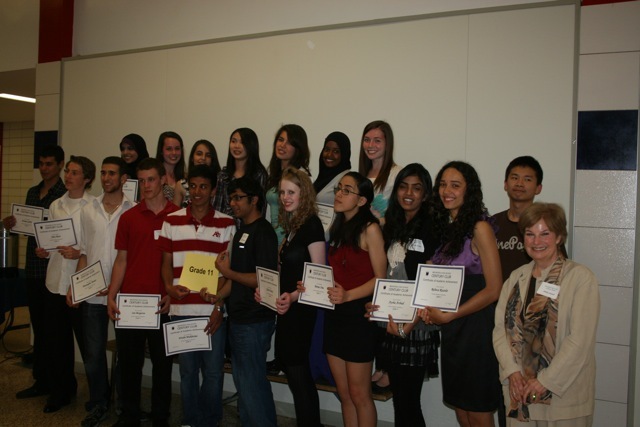 In May, I was at an exciting event at Brookfield High School to honour the success of the top 100 students this year. The event is called the Century Dinner, and was started 18 years ago. It celebrates the academic achievements of the top 25 students in each of four grades : 9, 10, 11, and 12. It includes a wide cross section of students from many programs including special education and Aspergers, and is a very uplifting event. By the way, did you know that Brookfield High School is the only school in the Ottawa Carleton District School Board that has produced four Rhodes Scholars? In my capacity as Chair of the Education committee, I have heard many heart-rending accounts from the parents of children with special educational needs. While our School Board prides itself on having the best special education program in the Ottawa Carleton area, there is serious concern regarding what many consider an erosion of our programs in this area, which range from programs for students with severe disabilities to gifted programs. Our new budget will help, as it strengthens our resources in special education. Also, the Board of Trustees has established an ad hoc committee on special education. This committee, which will report later this year, is undertaking a review of special education policy in order to ensure that no students fall between the cracks in the future. On October 6, 2011 there will be a provincial election in Ontario. As your Trustee, I believe we should be advocating for a fairer share of funding, especially in the areas of transportation/busing, special education and the physical renewal of our schools, where we face funding shortfalls. Does it seem fair to you that another Board in the Ottawa Carleton area is able to provide bus passes for secondary students but our own Board cannot afford to do so? It doesn't seem fair to me either. Over recent weeks, the new Chair of the Board of Trustees, Jennifer McKenzie, has been speaking with other Ontario Boards to assess whether our challenges are common to other large urban boards. We have also been speaking with local area MPPs to raise the profile of our funding shortfalls. As well, we recently passed a Board motion to collaborate with the Ontario Public School Board Association (OPSBA), which has called for September 20 to be Education Day in Ontario. OPSBA is encouraging school boards and local communities to organize all-candidates meetings on September 20, in order to promote education as a key issue in the provincial election. If you, your school council or community association would like to play a role in organizing this exciting meeting, please contact me at shirley.seward@ocdsb.ca in my capacity as the newly elected Director of OPSBA. Nothing gives me more satisfaction as a Trustee than working in our schools and communites. During the past seven months, I have attended school council meetings and events, and I have worked with community organizations and partners to advance public education in River zone. I appreciate and honour the hard work and commitment of school administrators, teachers, education assistants and other staff, parents and school councils at Brookfield, W.E. Gowling, Carleton Heights, Fielding Drive, General Vanier, Bayview and Clifford Bowey. I also want to recognize the role played by community associations such as the Carlington Community Association, Ottawa's Central Park Community Association, and the Carleton Heights and Area Residents Association (CHARA). And, I am grateful for the important contribution to our schools and communities made by OCISO, the Ottawa Community Immigrant Services Organization. As I perform my duties as your Trustee, my priority is always the students, their parents and our schools and communities. I wish you all a healthy and happy summer, and I can't wait to work with you again during the new school year. My initiation as your new Trustee has been very exciting. I was sworn into office on December 1, and I have enjoyed every minute of the last two months. This is the time of year when the Board turns its attention to preparing the budget. I have been working hard to reverse some of the cuts that were planned for this coming year, beginning in September 2011. These cuts included the elimination of several English as a Second Language (ESL) teachers and Multicultural Liaison Officers (MLOs). I know these supports are important in many of our schools in River zone, and for students with immigrant backgrounds. Stay tuned for the latest developments. The Board has just submitted its Capital Priorities proposal to the Ontario Government, and I am very pleased to report that both W.E Gowling Public School and Carleton Heights are included in the list of priorities. We have asked for $4 million for major renewal and rejuvenation of W.E. Gowling; as well as $2.4 million for the major work on Carleton Heights. This amount is in addition to the beautiful renovation of the Carleton Heights music room that has already taken place. We are discussing many other issues at the Board. As Chair of the Education Committee, on February 15 I will be hearing the concerns of many parents about special education. This meeting is open to the public and will generate a great deal of interest. At the same meeting, we will receive an update on the introduction of full day kindergarten. This is of great interest in River zone since W.E. Gowling and General Vanier are sites of this new approach to kindergarten. At our most recent Board meeting on February 8, I helped craft a successful motion to develop an advocacy strategy to secure a fairer level of funding from the provincial government. There is a serious gap every year between the actual cost of education in our Board and the funding we receive from the Ontario Government. As a result, every year the Board is forced to make painful cuts in special education, English as a Second Language (ESL) support and many other programs. As well as annual funding gaps, we have a large accumulated deficit in resources needed to upgrade and renovate our schools. I believe we need to deal with this serious funding issue, especially in the upcoming year prior to the provincial election. My priority is always the students, their parents and our schools. Over the past two months as your new Trustee, I have visited all of our schools and have participated in many Council meetings. I am looking forward to working with all of you to ensure that the Board does everything it can to support the River community. Please stay in touch, and share your ideas with me. Together, we can make a real difference. Shirley Still Running . . .
For Shirley Seward the municipal election is over and she has won, after being elected by acclamation in mid-September. But Shirley is still running, as she begins her work as Public School Trustee. 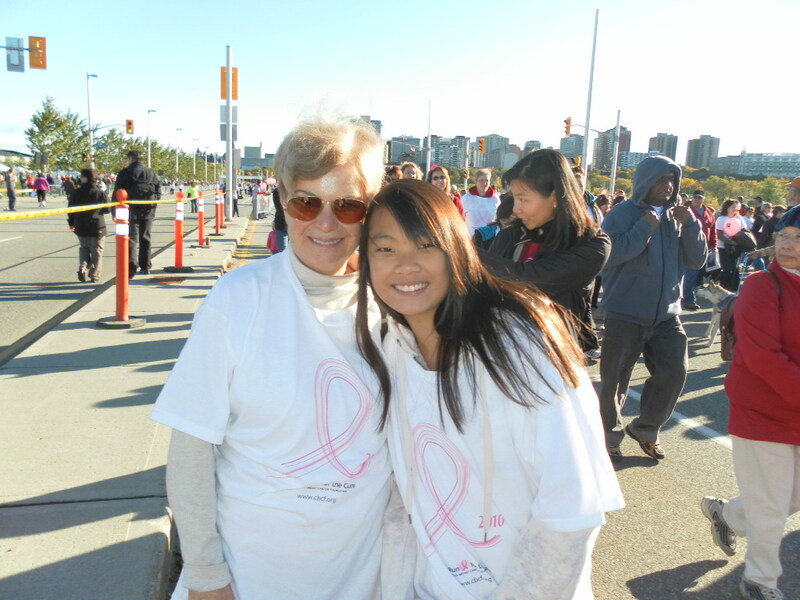 In the picture below, you see her taking part with her daughter, Rebecca, in the CIBC Run for the Cure on October 3rd -- though Rebecca did the 5 km. run while Shirley and her husband stayed with the one kilometer walk! Shirley also attended the Brookfield High School Council meeting on October 7th. One highlight of the discussions was a focus on improving student progress for those who are lagging by drawing high-achievement students into becoming Mentors for them. Over 40% of Brookfield students receive grades above 80% and are a key resource to help their classmates, and receive Community Service credits in return. Shirley is meeting later in October with Brookfield principal Jane Alexander to review the school's situation in more detail. Another challenge that Shirley has been following up is problems with school bus schedules for Bayview School. Parents have contacted her about bus delays and the complications they create for reaching work on time, and Shirley has been working with the bus company, school board staff and Bayview School authorities to improve the situation. Shirley has also had especially useful discussions with Michael Birmingham, Executive Director of the Carlington Community Health Centre. Birmingham is an expert on "youth in crisis" concerns, and his Centre is responsible for a whole set of social interventions to help young people in some of the most disadvantaged parts of Ottawa. Shirley and Michael identified closer co-operation between the Centre and the public school board as an important priority, and promised each other they would work hard to make this happen in the months ahead. Shirley Seward and her daughter, Rebecca, joined 9000 other Ottawa people on October 3rd in the CIBC Run for the Cure, raising funds to fight against cancer. Now that she has won election as public school trustee for River zone, Shirley is setting to work. A key priority is strengthening consultation between the community and the Public School Board. With this in mind, Shirley met with the executive board of the Central Park Community Association, to discuss new mechanisms for better public participation in school board planning and decision-making. "There are complications at the moment," Shirley told the executive. "Many parents in Central Park send their younger children to Agincourt school for French Immersion, but that school is outside River zone, so the parent council for that school connects with a different school trustee. But the Central Park parents here rely on the River zone trustee to represent them when they have concerns -- as with the crowding and school bus problems affecting their children at Agincourt." Shirley is also building formal links with other parts of the rich diversity that makes up River zone. On October 7th, she has been invited to attend the Brookfield High School parent council meeting. She and the Canadian Somali Mothers Association are also working out a date for community consultation. And, as noted previously, Shirley took part in the recent grant presentation at Clifford Bowey school, in the area of the zone east of Bank St.
Several hours before the deadline to declare as candidate, the previous public school trustee withdrew his nomination, and Shirley Seward was elected by acclamation! This was the surprise conclusion of Shirley's rapidly growing campaign in River Ward -- as she carried her own door-to-door canvassing into over half the polls in the zone, with "Shirley signs" springing up on people's lawns in every area. "I am deeply honoured to be elected as your new public school trustee," Shirley said. "I have listened at over 1500 doors during my campaigning, and I will keep listening to all parts of the community in the four years ahead." Shirley thanked her supporters and volunteers, and all voters in the ward. "Together," she vowed, "we will contribute to building excellent education, and make all our schools vibrant centres for our different communities." Shirley also stressed her commitment to social equality and support for disadvantaged groups, including children from new immigrant communities and the disabled. Shirley's first official act as school trustee-elect was to take part in a grant ceremony at Clifford Bowey School, where S'Cool Life Fund presented pool equipment for the students with developmental disabilities that this specialized school serves. Shirley also expressed thanks to outgoing school trustee Riley Brockington for the two terms of service he contributed. Shirley Seward speaking on Rogers TV Local Campaign Coverage -- see her Oct 11 at 10pm (Channel 22) or Rogers "On Demand"
As of the first day of September, Shirley Seward has taken her door-to-door campaign into 16 of the 55 polls in Zone 11, working to become a new public school trustee who will listen to the community and improve our schools. Also on September 1st, the voters' list was released for the October 25th election, showing 21,297 people who can take part. This list permits a wider effort to start to contact each and every voter. This September outreach surge starts now, with a new pamphlet being taken to every household over the next four weeks. The leaflet discusses the concerns Shirley has been hearing as she listens, and outlines the many qualifications that will help Shirley bring leadership to the public school board in building excellent education. Shirley has also been attending community events, such as the Carlington Community Association's Potluck Picnic on August 29th at Meadowvale Park. One key topic of conversation with a participant there was physical and learning disabilities and how best our school system should respond effectively to these. As Shirley's campaign continues, donations are flowing in, signs continue to go up, community leaders are endorsing Shirley as their choice, and the candidate is bubbling with energy and enthusiasm! With lots of help from the extended family, as the picture below shows . . .
A family gathering as the campaign goes on -- grand-daughter Zya grabs center-stage as Shirley, Steven, Sarah and Rebecca welcome Jon and Liliona on their return from Ghana where they spent the summer. Dozens of "Shirley Signs" . . .
August 26th was the first day that election signs could go up on private property for Ottawa's municipal vote on October 25th. And right across River Ward, from Merivale to Prince of Wales to Riverside, Walkley and Uplands, "Shirley Seward" signs suddenly appeared -- evidence of the widespread support Shirley is winning in her race to become our new public school trustee. As she speaks with voters door-to-door, Shirley hears people saying they want change and improvement. There are more and more indications of problems in the Ottawa public school system. The latest is the sudden surprise resignation of the Director of Education just two years after he was hired. The patchwork inequality of the full-day kindergarten start-up also continues to hurt parents and children. Plus school closings spread in this zone, while other trustees protect their community schools. Shirley pledges to listen to our communities and provide leadership to achieve excellent education for the rich diversity of children, responding to their different needs. That's why people are putting dozens of Shirley's signs in front of their homes. On Your Doorstep . . .
Expect to see Shirley Seward at your door. From Walkley Road to Baseline to Riverside Drive, Shirley has been meeting families and individuals as she works to become your new public school trustee. On Baseline Road, Shirley talked with a younger woman who was upset by the closure of Laurentian High School, and the traffic congestion from the new Walmart Store that is replacing the school. She also heard from an older couple saddened by the shut down of McGregor Easson School in the area. On Riverside Drive, a retired businessman told Shirley how angry he was that a lot of funds had been spent to improve Bayview School, and then it had been closed, wasting all that tax money. Another family explained how one of them had taught for years at R. Byrns Curry School, and had fought hard to keep it serving its students. But the hopes of teachers and parents were ignored. On Walkley Road, Shirley met with young families and their children. She heard how important they felt good public education was to their future -- and how worried they were by problems they saw increasing in the school system. The particular needs of their children, they felt, were being forgotten in the push for uniformity and closing classrooms. As she campaigns door-to-door, Shirley is becoming ever more motivated. 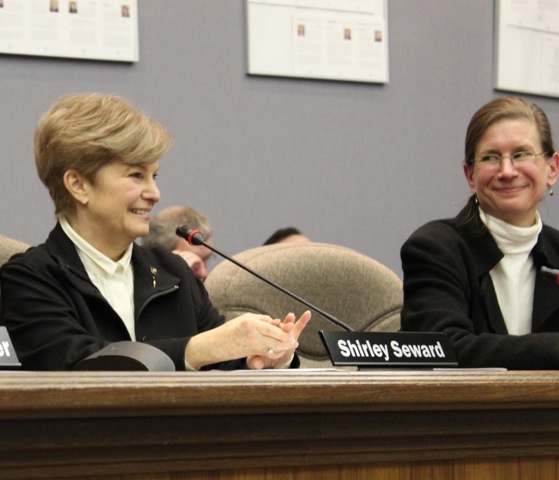 "We need a new trustee who listens to people, and can give leadership in the fight for excellent education," Shirley Seward says. Set to go: Shirley Seward signs her nomination papers for public school trustee in Zone 11. Election day is October 25, 2010. As Shirley Seward continues her campaign for public school trustee, she hears one major message from groups and individuals she is meeting -- the School Board must listen more to people to make our schools better. Shirley herself is doing just that. She is in the community, listening carefully to a wide variety of voices, so that she can work for an excellent education for all. From the chair of the School Council at Brookfield High School, to the President of Carlington Community Association, to the chair of the School Council at Clifford Bowey Public School, to the founder of the Canadian Somali Mothers Association, Shirley has talked with many key leaders and discussed their concerns with them. One of many people worried by school closures is John Nihmey, chair of the last School Council at R. Byrns Curry School, one of three schools shut recently in Zone 11. He told the Board that he opposed this shutdown because it meant "some students will have moved three schools in three years." The Canadian Somali Mothers Association also complained to the Board this year: "it seems our voices are not heard . . ." The Association points to the "difficulties" that their children are experiencing in Ottawa schools, and stresses that "we believe the schools are not doing enough to address these difficulties and may well be exacerbating the problems." Cutbacks in financial support for programs for recent immigrants will make these school failures worse. Shirley has also heard worries expressed about the confused implementation of the Ontario government's full-day kindergarten policy. She is meeting with a number of child care groups, including parents from the program based at St. Elias Church. Listening is crucial, Shirley knows from her previous experience working on education at the national and international level. That listening is step one in providing leadership -- to better respond to the needs of people in Zone 11 and to shift School Board policy in more positive directions. Shirley Seward’s campaign for public school trustee is heating up, just like the hot summer weather in Ottawa. For many supporters, Shirley represents a woman with national and community experience at building agreement and providing leadership. The public school board, they feel, has been caught up in internal conflicts and has forgotten its main job of shaping a vision for excellent education in Ottawa. Some of Shirley’s new supporters have been especially concerned about the limited consultation when schools have been closed down. “School trustees have to listen very closely to the community and work with them -- not leave parents angry,” Shirley says. Shirley is gaining support from many different groups throughout the zone.